It’s difficult to say which was my favorite, They were all delicious and beautiful works of art on a plate…or a pizza paddle. The classic Margherita Pizza is pretty hard to beat. We used my all purpose spaghetti/pizza sauce which I have at the ready in my freezer, fresh mozzarella, grated parmesan and fresh basil. Easy pizza-y! I was intrigued with the Pear Pizza I read about in Maxine Clark’s cookbook, Pizza Calzone & Focaccia. She pairs pecorino with taleggio cheese (we substituted fontina), which was an amazing combination. Start with olive oil, the fontina, ripe Bosc or Starkrimson pears, fresh sage leaves and pecorino. Drizzle honey over the top and you are ready for the oven. Very inventive! This was definitely one of my faves. The Sicilian Shrimp Pizza was the most beautiful, also inspired by Clark’s book. Created by Lynn, Chris and Gerry. Start with my pizza sauce, add garlic, red pepper flakes, shrimp and beautiful fresh Farmer’s Market red and yellow cherry tomatoes. Remove from the oven and scatter with parsley and a drizzle of olive oil. Caramelized Red Onion Pizza from Maxine Clark’s book, Pizza, Calzone Focaccia. I have come to love caramelized onions. A simple pizza with mozzarella, the onions, parmesan, anchovies, kalamata olives, capers and anchovies speaks to me. Although the team of Karen and Pete decided to skip the anchovies. Not me! Hannah gets creative in our Pizza Class. Hannah, our Sous Chef, loves this class and is ready to help out everyone! 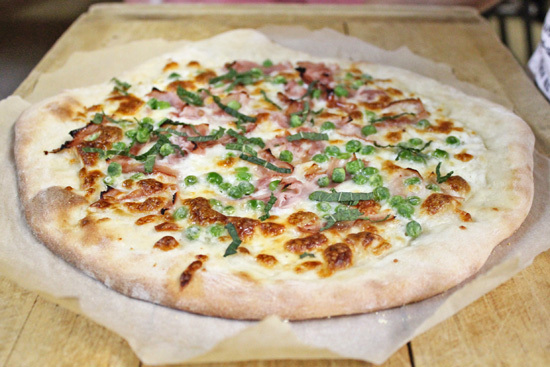 Ham and Peas Bianca Pizza from Jim Lahey’s book, My Pizza. The Ham and Peas Bianca Pizza was the most creative. It mimics one of my favorite pasta dishes. Using first a Béchamel sauce, parmesan, mozzarella you get a white base to which you add some thinly sliced ham and frozen peas. I recommend adding the peas while frozen so they don’t dry out in the oven. Top with fresh sliced mint. Yummy! A Pizza Party can be a wonderful way to entertain while everyone gets a chance at turning dough into a wonderful creation. Heat your oven to 450 degrees and put everyone to work! 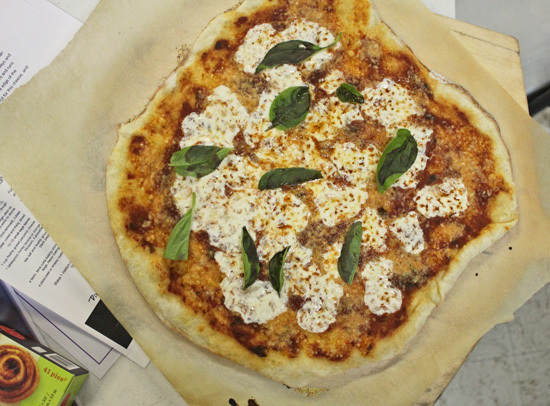 When you are making a lot of pizzas, it’s important to have your guests use parchment paper (we used Paper Chef) sprinkled with cornmeal as a base to place their pizza dough on. You can scoop up the pizzas easily with a pizza paddle or cookie sheet and then transfer them onto the hot pizza stone in the oven. Click here to get my One-Minute Pizza Dough recipe. Click here to get my all purpose Spaghetti/Pizza Sauce recipe. Store containers in the freezer, so it’s ready when you are. 1. Melt butter on low in small saucepan. Add flour and stir to coat. The butter-flour mixture is a roux, so cook the roux for a few minutes until it is fragrant. 2. Add the milk to the pan and whisk together until the flour mixture melts into the milk. Turn heat up to medium until milk is hot and continue to whisk until the mixture is near boiling. Once it starts to thicken, turn the heat down to a simmer. Use a rubber spatula to scrape the bottom of the pan, so the flour does not scorch. 3. Once the sauce has thickened, add a pinch of nutmeg and remove it from the heat. Refrigerate until you are ready to use in your recipe. Can also be stored in freezer and thawed out when needed. Entry filed under: Bread, Cooking Class, Entree, Food, Food Blog, Italian, Recipes, Vegetarian, WordPress. Tags: caper, cheese, cooking class, flour, ham, milk, olive, onion, pear, peas, pizza, shrimp, tomato. Pies and Tarts Cooking Class – November 14, 2013	How to Roast a Red Pepper…yellow, orange or green. What a great selection of pizzas! Your classes look like so much fun. Can’t wait to take one sometime. Oh my YUMMMM! What fun!! I love all of these ideas!! !